Once again, another holiday is sneaking up on me! If you celebrate Hanukkah, you too may be surprised to learn that it starts this coming Sunday night! Didn’t we just have Thanksgiving? Yikes! It’s tough keeping up! But in any case, if it’s Hanukkah, it means latkes and it doesn’t get much easier than this mashed potato version. So get out your dreidels and your potato peeler, ‘cause it’s that time of the year again!! Making latkes makes me miss my grandpa. He was so fond of them and so even though I griped about the greasy, smelly mess they made in the house as I fried batch after batch, I didn’t really mind that much when I saw how happily he gobbled them down! 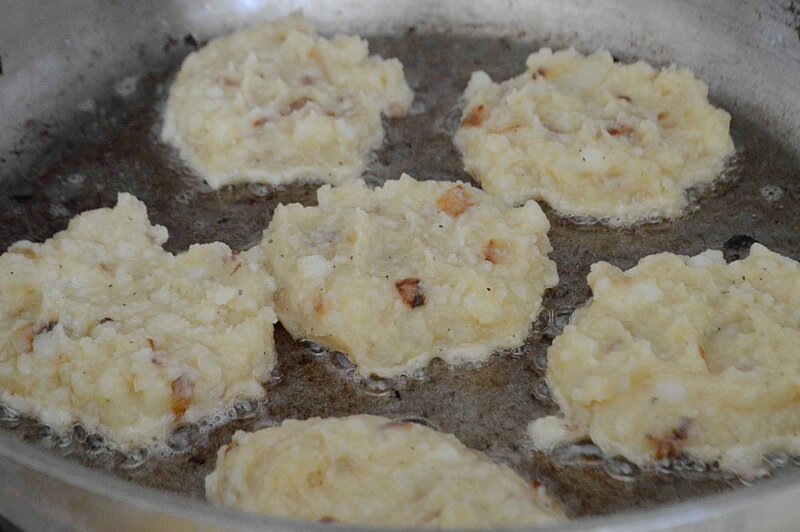 After you sauté an onion so that it’s nice and golden brown, you simply mix it together with the mashed potatoes and some eggs, salt and pepper, form into little patties and fry. They sort of remind me of the filling for a knish but with a crispy, golden brown exterior, which in other words, is pretty much perfection!! Serve ‘em up with a little sour cream and applesauce and whether you celebrate Hanukkah or not, people will love them! Don’t want tamper with the tried and true? Try this traditional version. Feeling adventurous? Give these Potato-Apple Latkes with Cinnamon Sour Cream or these Latke Waffles a try. Or if you’re determined to keep things healthy, what about these Baked Zucchini-Potato Latkes? And if you want to make things really special, whip up a batch of Nancy’s Rosy Applesauce or this Divinely Delicious Roasted Applesauce to serve on the side. No matter what, you can’t go wrong! Happy Hanukkah!! If you’re using leftover mashed potatoes, dump them into a large bowl and break up any clumps with your hands or a potato masher. If you make fresh mashed potatoes for this, let them cool to room temperature before you mix them with everything else. Heat the 2 tablespoons oil in a large skillet over medium-high heat and sauté the onions until golden brown. Scrape into the bowl with the mashed potatoes and combine. Don’t wash the skillet. Let the mixture cool down a bit so that the eggs won’t cook when you add them. When mixture is cool, mix in the salt, pepper and eggs and stir well to combine. Heat a couple of tablespoons of oil in the skillet over medium heat. When oil is shimmering add tablespoons of the batter to the hot oil, sort of pressing down on them to spread them out. Don’t crowd them too much in the pan—I was able to cook about 6 at a time. Let the patties cook for a few minutes until golden brown on the bottom. Then use a spatula to carefully turn them over and allow the other side to brown. Drain the latkes on paper towels and serve immediately or keep warm on a baking sheet in a low oven. Note: Recipe adapted from my need to use up lots of leftover Thanksgiving mashed potatoes and take care of Hanukkah festivities at the same time!